February 23, 303, saw the celebration of Terminalia in the Roman Empire – the day pagans boasted they would put an end to Christianity. During this festival, because of the encouragement of Galerius Caesar, the emperor Diocletian issued an edict ordering the destruction of the newly built Christian church in Nicomedia. The city prefect went to the church with many officers and assistants and forced open the doors, removed all of the sacred books and burned them, confiscated the treasury, then leveled the building itself, all while Diocletian and Galerius observed. Following this, a general edict was issued for the entire empire, commanding the destruction of all Christian churches and texts, along with naming all Christians as outlaws. In Nicomedia, all Christians were being rounded up and imprisoned and Galerius privately ordered the imperial palace to be set on fire and accused the Christians of the crime so as to persecute them with greater severity. Executions began immediately and no distinction was made for age or gender – all Christians were being slain equally in various torturous ways. Houses were set on fire, whole families were burned alive and others had stones placed around their necks, tied together and forced into the sea. Although the entire empire received the edict, the most action was seen in the East. The Christian city of Phrygia was set ablaze and the entire population perished. The other two members of the Tetrarchy, Constantius I and Maximianus Caesar, were less draconian about the attempt to return the empire to the golden days of paganism. They were still involved in issuing and carrying out edicts against Christians, but only this first edict was enforced in the West, where Christians were stripped of their belongings and treated as criminals. During the summer of 303, rebellions began to break out in Melitene and Syria, and Diocletian issued a second edict. This one ordered the arrest and imprisonment of all bishops and priests. Technically, it wasn’t necessary, since the first edict still covered the clergy, but Diocletian may have issued it because the extermination of the religion wasn’t happening quickly enough. The second edict was so successful that the prisons were overflowing with clergy, and the other prisoners had to be released to make room. In November, Diocletian was approaching his 20th regnal year and apparently needed some goodwill. He issued the third edict, this one declaring a general amnesty for any imprisoned Christian clergy who would make a sacrifice to the Roman gods. This worked to clear out some of the prisons, but there were still problems. 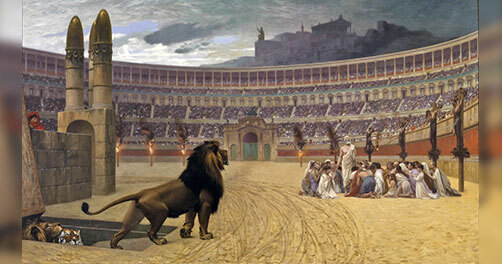 This led to the fourth edict, possibly in January or February 304, where all Christian prisoners were called to the public square for a mass sacrifice to the gods. Those who refused were executed. The Balkans rolled out the edict in March, Thessalonica in April and Palestine soon after. This last edict wasn’t enforced at all in the West under Maximianus or Constantius. In May of 305, Diocletian and Maximianus retired, promoting Galerius and Constantius from caesar to augustus and Severus II and Maximinus II were elevated to co-caesar. Galerius and Maximinus continued the persecutions with great enthusiasm in the East, but in the West there was discontent in the Court. Maxentius, son of Maximianus and Constantine I, son of Constantius I, were both angry about being passed over for the position of caesar. Constantius was on campaign in Britain against the Picts in 305-306 and went to Eboracum for the winter after his success in January. In July of 306, Constantius died and named Constantine as his successor, to the dismay of Galerius. Constantine immediately ended the persecutions in the West and returned all seizures to their owners in his part of the empire. By doing so, Constantine portrayed himself as the liberator of Christians. Maxentius was at work doing the same – he seized power in Rome in October 306 and issued a tolerance of Christianity in his sphere of influence. Galerius made two attempts at overthrowing Maxentius, both of which failed. During the first campaign, Severus was captured and executed. Galerius still continued with persecutions in the East until he was on his deathbed in 311, where he finally issued a proclamation to give Christians the right to exist freely and to have peaceful assembly. Even so, Maximinus was not to be deterred. Months later, he renewed persecutions in his part of the empire and continued for two more years, until co-augusti, Licinius I and Constantine, met in Milan in February 313, and issued the terms of universal peace, known as the Edict of Milan. When Maximinus was defeated by Licinius in April 313 and finally died in August, it ended 10 years of the most brutal and widespread actions against Christians during the entire period of the Roman Empire. ANTIOCH.Maximianus II AD 310-313.AE.”Persecution” issue. ~~~Tyche of Antioch. ~#~.Apollo. TEMP. MAXIMINUS II. AD 310-313. TIME OF MAXIMINUS II. AD 310-313. ALEXANDRIA MINT.